Paint and ink on unsized paper will absorb down into the paper and not allow you to build up layers. Some special techniques use unsized paper but typically you want to paint on sized paper. You can buy the paper sized already or you can size it yourself. You have more control for preparing the surface exactly as you want it for your own painting needs if you size it yourself. Mix a thin mixture of glue + water, more water than glue, should be a light tint of yellow. Add a small amount of alum crystals (we used about 1 1/2 tsp for a bowl). Be careful with this as it is acidic and too much will hurt the paper surface. Let the alum sit and "melt" in the liquid, this might take 10-15 minutes. Mix it well once it has dissolved into the glue mixture. Designate a wide hake brush your dhosa brush. You don't want to use this brush for other purposes once it has been used to size paper. In slow even strokes apply the dhosa to the front (typically the smoother side) of your paper. You can stop in the middle of a stroke to re-wet your brush but don't go back over what you have done...start where you left off. If you double size a part of your paper it will take the paint differently in that part. It doesn't matter what direction your strokes are except each stroke should continue in the same direction. When the entire paper is sized let it dry. This will probably take several hours, overnight is best. * make dhosa fresh, it doesn't keep overnight. * you can use a thinner mixture of this size to stop metal leaf from oxidizing. * there are many special techniques you can do with sizing, such as putting a layer down on the unsized paper and then apply dhosa, or initially only sizing portions of the paper, then paint and then size again...just be careful about how much alum you use as you don't want a big build-up of it on your paper. * Dhosa can also be used if you have a layer of pigment not sticking. Spray a light thinner portion of dhosa over the surface and let it dry, this should settle the pigment. (then think about adjusting your glue as pigment falling off the paper is a sign of not enough glue in the pigment mixture). 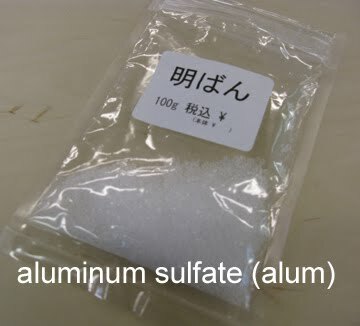 i thought alum was an alkaline substance? 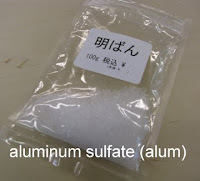 Alum is alumminum sulfite and I'm not enough of a chemist to do anything but quote wikipedia (which can be dangerous) where it says its both a specific compound and a class of chemical compounds. Its definitely acidic rather than base. Basically when I buy it, I buy "alum."